One might think that there would be some end to Target’s fuzzy, crazy or just nonsensical math. But then who would we poke fun at? Just so long as you remember to read all the labels before you buy, it’s an amusing experience for customers and whatever the opposite of a learning experience is for Target. 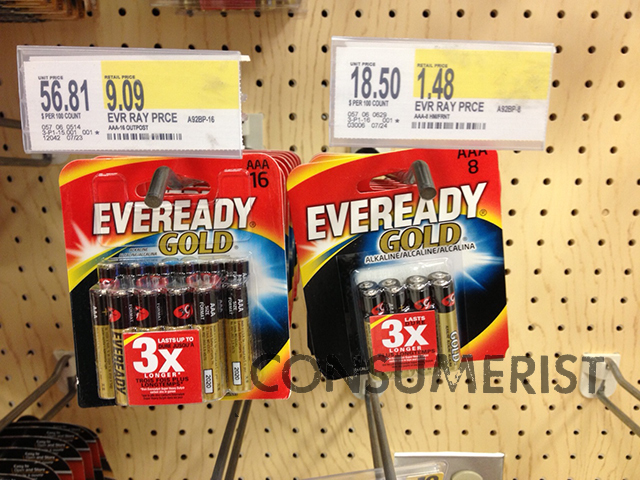 Consumerist reader Mark spotted this non deal at Target — 16 batteries for $9.09, or roughly $0.57 per battery or 8 batteries for $1.48, about $0.19 per battery. And by that, he of course means, and we would like to reiterate, that the “great deal” is the one where you’re paying less for batteries. At least this display doesn’t have any of that “SALE!” or “GREAT DEAL!” nonsense signage posted near it because that would just be totally unheard of. Ha, just kidding. Happens all the time.